We're now at the stage where many people can write and publish articles directly from their phones or tablets. With larger screens for phones and great external keyboard support on tablets, there really hasn't been a better time to start writing on your mobile devices. 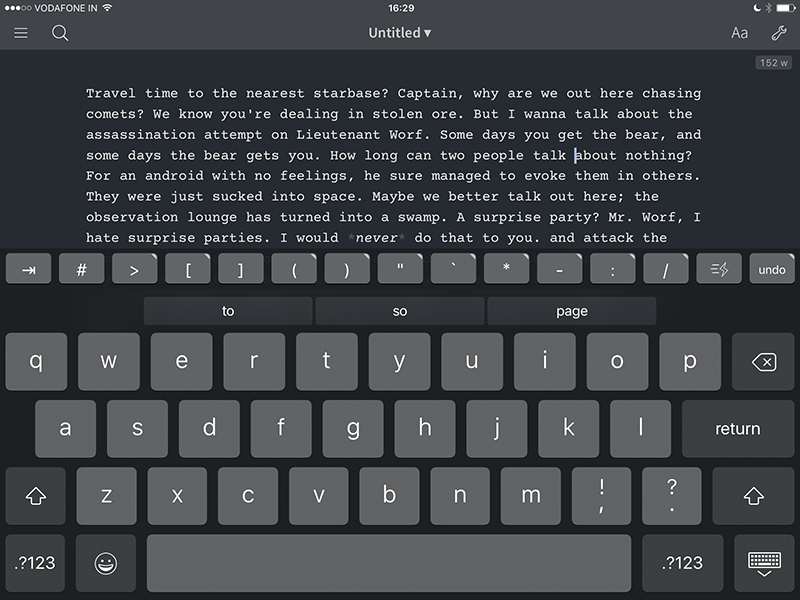 Here are the best writing apps for iOS and Android according to us. Most of them also support markdown, which is something every writer should be aware of. Whether you're working on your novel, or just preparing reports for the office, you'll want to check out these apps because they are a big step up over the default notepad style apps. 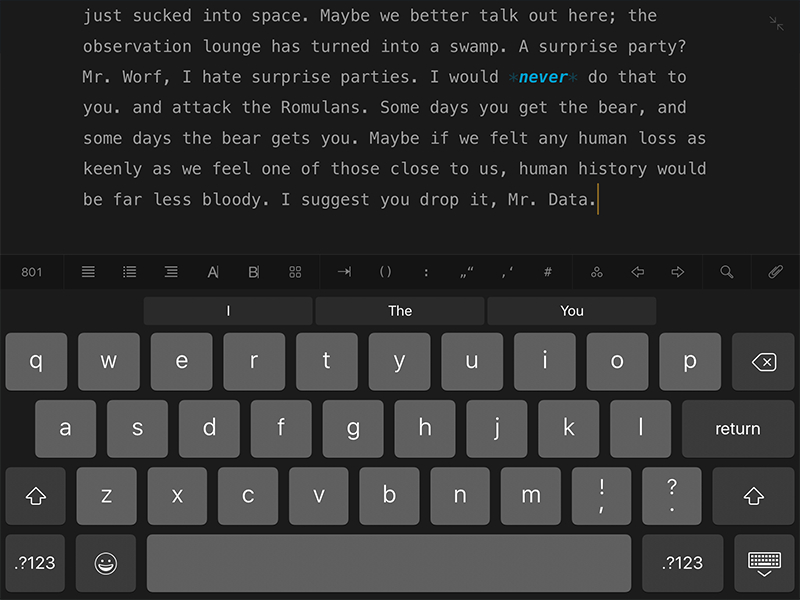 iA Writer is one of the most well-known writing apps available, and for good reason. It looks great and works brilliantly across iOS and Android. While the Android version is a little behind in terms of features, it is still a good writing app for the platform. The iOS app has extra features, such as syntax highlighting, which allows you to see adjectives, nouns, adverbs, verbs, or conjunctions in the document highlighted and much more. The iOS app also has full support for iOS 9 specific features like split screen. 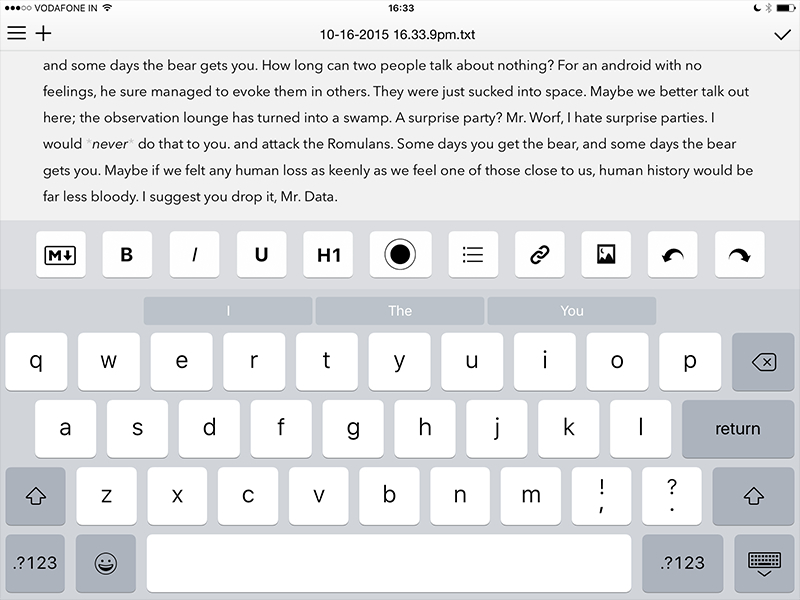 I'd say the Android version is more of a beta compared to the iOS version at this point, but regardless of your platform, iA Writer is a good choice. 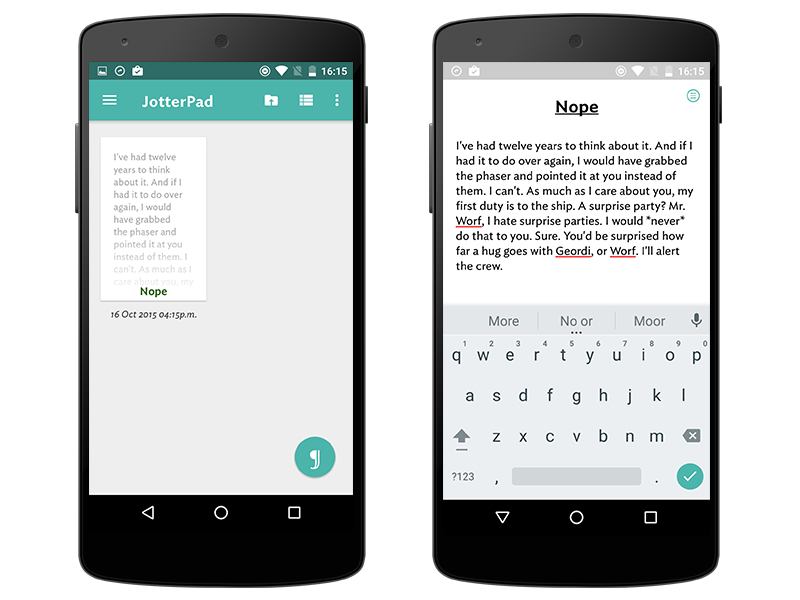 JotterPad is well designed and has a boatload of features that make it one of the better writing apps out there. It sports a Material Design look and has export options to PDF and DOCX. It even supports Markdown. The app is free to download but many of these features are behind a one time in app purchase of Rs. 350 to unlock Creative Mode. The great use of design and the smooth operation of JotterPad make even the free version a good option is you're looking for a scratchpad that works great on Android. The full featured version is even better, and can measure up to most of the other apps on the list for some serious writing. 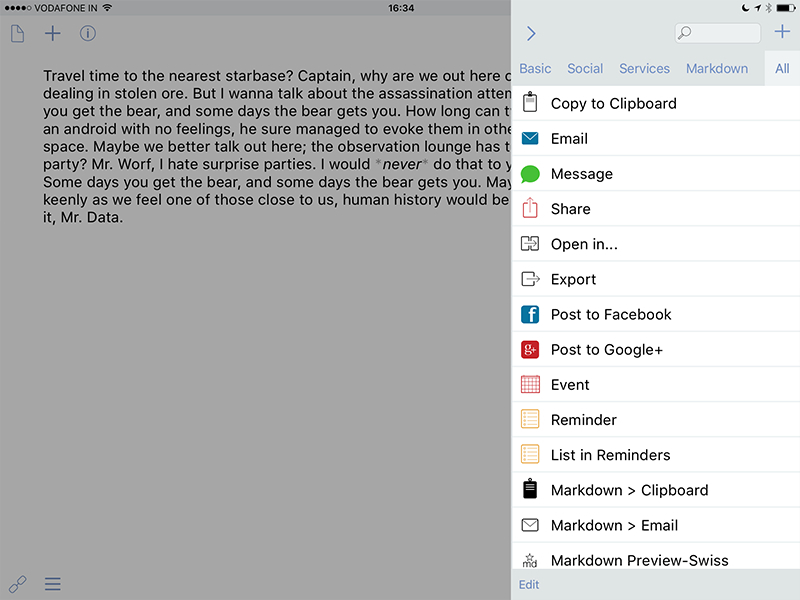 Editorial is one of the most powerful apps that exists today, without even narrowing this to writing apps. It does everything that a good writing app should do, and so much more, with support for workflows and an intuitive and powerful interface. Editorial has robust Dropbox sync, with version support and a healthy workflow community online that can make exporting and even publishing from the app a cinch. Editorial is the perfect combination of a great interface that adapts to your needs. Editorial is professional grade software that's a little expensive, but well worth your money. 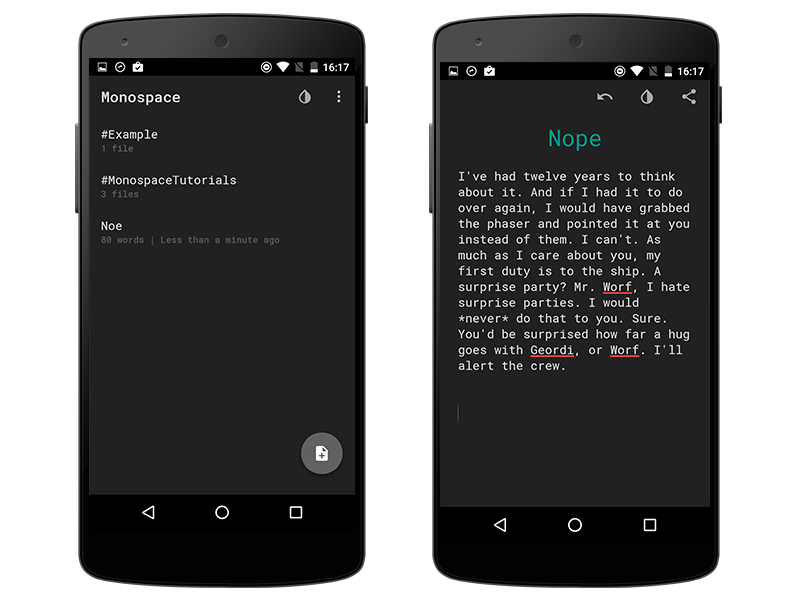 While it is currently in beta, Monospace is a nice barebones writing app. I like the dark theme a lot. One interesting feature is the ability to organise with hashtags instead of folders. The current version supports Dropbox sync as well. While Drafts can be used as a proper writing app, its best use is for quick entry of your thoughts, to use elsewhere later. Drafts also lets you send text to tons of services and apps. Think of it as the best scratch pad available for writers. It also has an Apple Watch app to view your Drafts inbox and it supports split screen on iPad. One of the best things about the app is the customisable bar above the keyboard for Markdown shortcuts. I never thought I'd recommend using Microsoft Word over many writing apps because it has always felt too bloated. 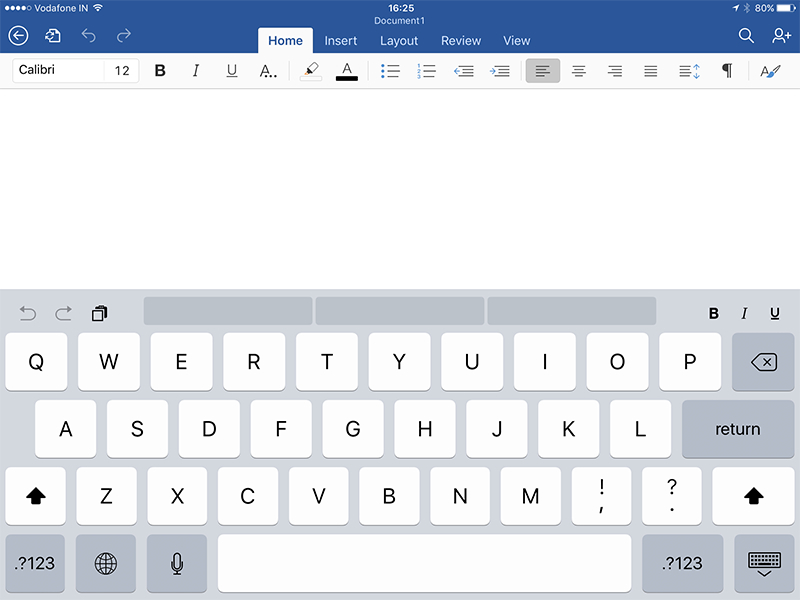 Recently Microsoft has been improving the iOS and Android apps with each update and now Word has become a good overall writing app. The iPad app even supports iOS 9 specific features. Dropbox integration being added was a surprise and things like that along with a nicely thought out interface make Word a great app. Write's flagship feature is a cursor nub (similar to what you see on some Lenovo laptops, in the middle of the keyboard) . This can be used to accurately place the cursor while typing. Write also supports tons of sharing services, passcode lock, granular interface control, and more. If I had to pick one single app on iPad that has the best overall writing experience, I'd pick Ulysses. It may not have as many features as the super power user apps but it looks amazing and does the job brilliantly. It is iPad only, but a must have for the platform. It is mind blowing how many great things are crammed into this app. Markup, images, footnotes, links and comments are all supported, and you can export PDFs, Web pages, ebooks, or Word documents. 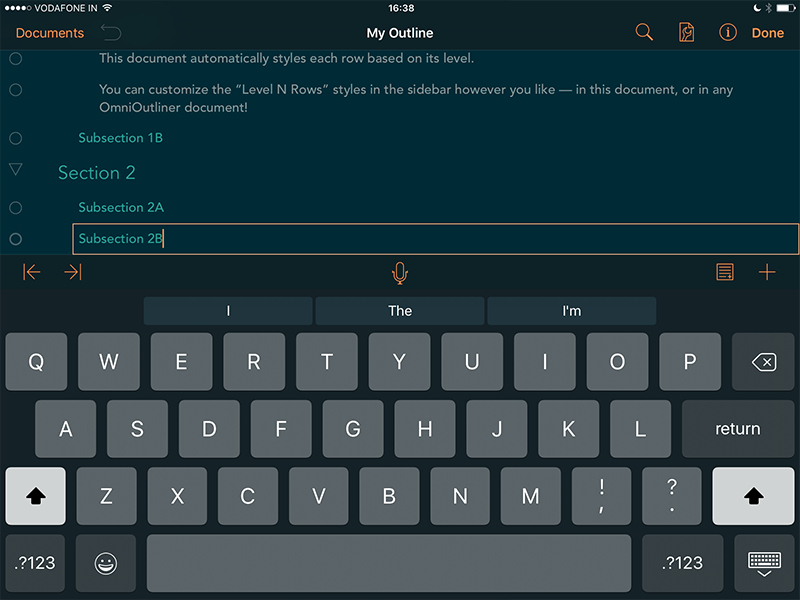 A clean, distraction free interface, three panel layout, and customisation for the colour palette are just some of the features that make it a great app to use for writing. While the apps listed above give you a great writing experience, OmniOutliner by Omni Group does so much more. It is your single stop for outlining ideas, organising them, putting them into article form, and more. It lets you create reference nodes for quick access, export in a variety of formats, and has great external keyboard support. OmniOutliner is not an app for everyone but it does so much that if you have ever needed something like this, there's nothing that comes close. It is a pro app that is not held back by legacy restrictions. The Gadgets 360 team loves the picks above, be we also had to add one of our favourite apps to this list. 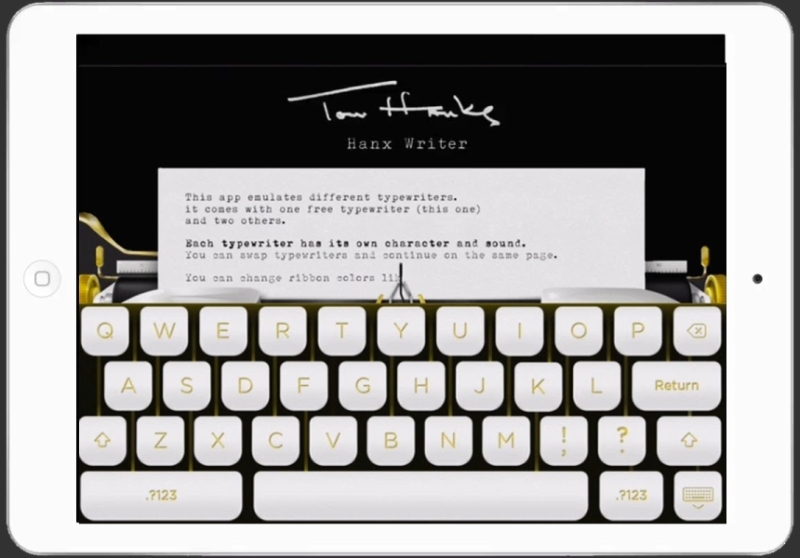 Hanx Writer - made by actor Tom Hanks - is not a great writing app in the same way that the others in this list are, but if you're a fan of typewriters, and want to mail someone a letter that looks typewritten, then this app is a great option. The entire interface is laid out like a typewriter, and you can type away with great animations and audio design. The actual text editing experience is also like a real typewriter, with the default mode not allowing you to delete text, instead striking it out. The minimal options available actually allow you to focus on your typing, and the clacking sound can be quite soothing while also serving to cut out distractions. It's free to try, and the paid features just include more typewriter styles, so you definitely don't have to spend money to enjoy this. The final text can be exported as a PDF, to print or to mail. 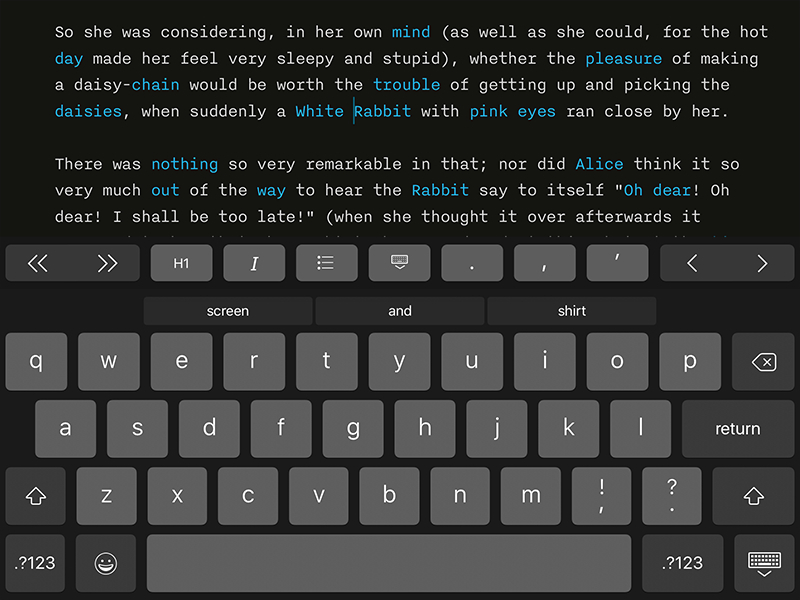 These are our favourite writing apps, what about you? Tell us which writing apps you use on your mobile phone or tablet, via the comments. Why are Indian Companies Bothering With Apple Watch Apps?